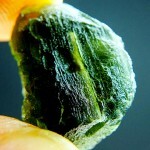 All moldavites contain bubbles, but not all are visible with the naked eye. 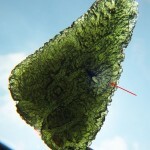 The size of bubbles ranges within a hundredth of milimetre and a couple of centimetres. 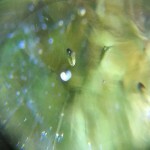 Most often there are bubbles sized between 0.01 and 0.9 mm. 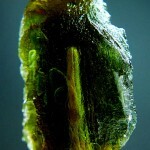 Bubbles represent about 1% of the volume of a moldavite. 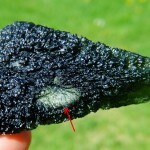 Moldavites from South Bohemia contain more bubbles than Moravian ones. 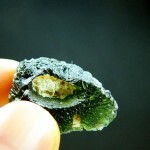 The walls of the bubbles are smooth. 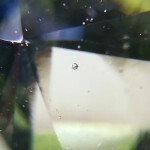 The shape of a bubble is spherical, lens-like or oblong. 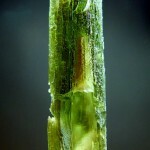 Sometime bubbles can be so long as to create channels. 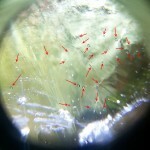 Bubbles can be diffused or they can be located in groups or lines. 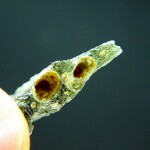 Oblong bubbles and channels are oriented in the same way as fluidality (the direction of flow of tectile melts at high viscosity). 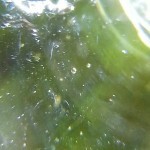 There is very low pressure in bubbles (almost vacuum). 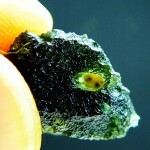 Most bubbles is a residue of gases contained in parent material. 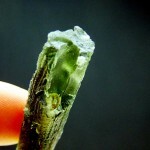 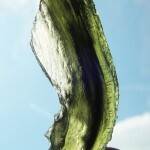 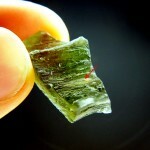 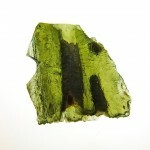 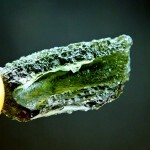 They can also be a consequence of internal tension during the process of hardening of the moldavite molten glass. 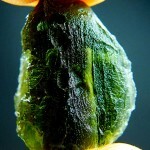 On the surface of some moldavites there are open bubbles which can be as big as several centimeters. 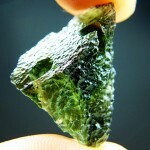 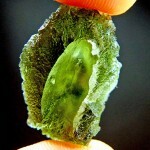 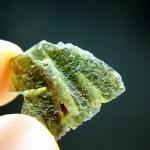 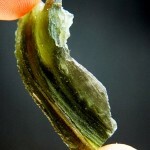 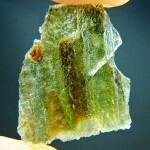 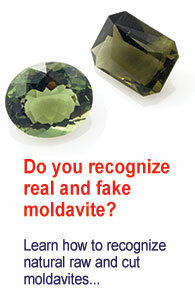 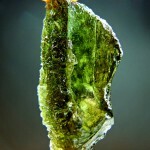 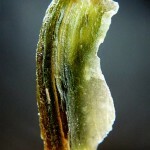 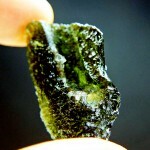 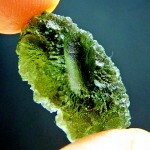 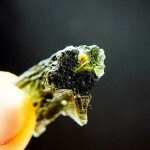 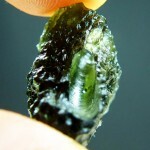 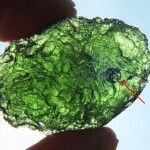 They can be partially-opened – created by etching the surface of a moldavite – or completely opened. 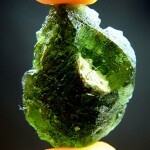 The latter ones were made by the moldavite breaking, either hile transporeted, by a fall or as a result of internal tension. 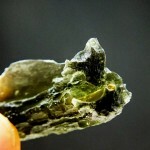 Some bubbles are partially filled with sediment or – more rarely – by ferruginous sandstone. 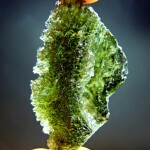 As described above, Channels are long bubbles which we can imagine as pipes going through a moldavite. 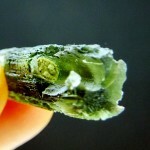 In some cases they go all the way through the stone and there is an opening at each end. 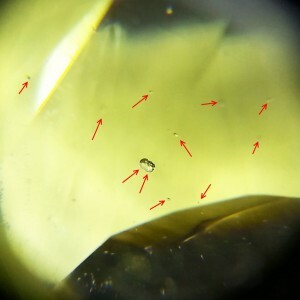 In other cases there is only one opening. 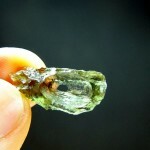 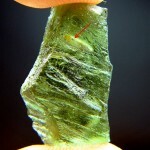 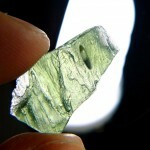 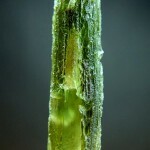 There are open channels which look like a straight canal (can be seen mostly on moldavite fragments). The width of channels ranges from a hundredth of a milimeter to several milimeters. 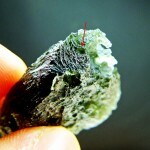 One stone may contain more channels. 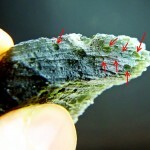 Narrow channels coming up on the surface (open-ended channels) are very often filled with fine sediment which was brough by water from surrounding clay and gravel. 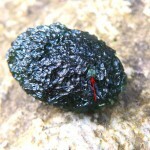 Channel may be found in moldavites from South Bohemia very frequently.